Stretch Tuesday seems to roll around pretty quickly and it’s time for me, BugDoc Dave, to have another go! As Galen and Kathi stated, the Great Lakes Carnival Convention has officially come and gone. I really appreciate the club for inviting Renée and me to talk about iridescent stretch glass. Galen and Kathi were busy taping the talk and since I went pretty long, it may take some time for them to edit it! LOL! I tried to show most of the glass colors used to make iridescent stretch glass and many of the participants exclaimed that they were unaware of the spectrum of colors used, especially the opaques! So, I’m going to cover the opaque colors, but it will take me two Tuesdays! 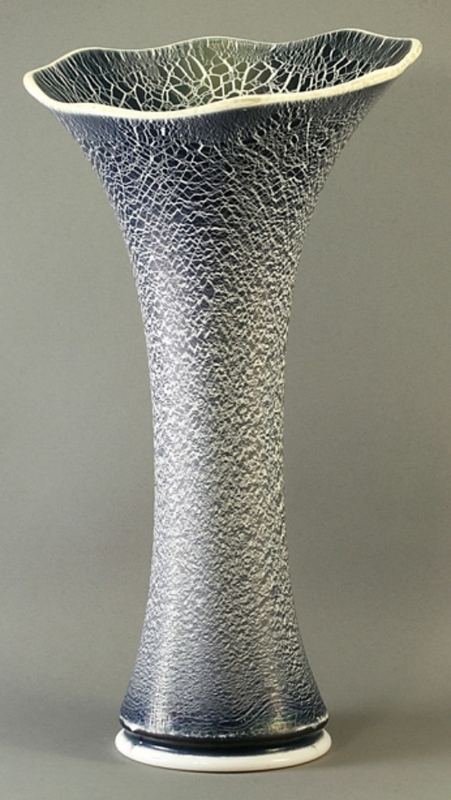 The opaques made by U.S. Glass, alone, will be covered in the next article. 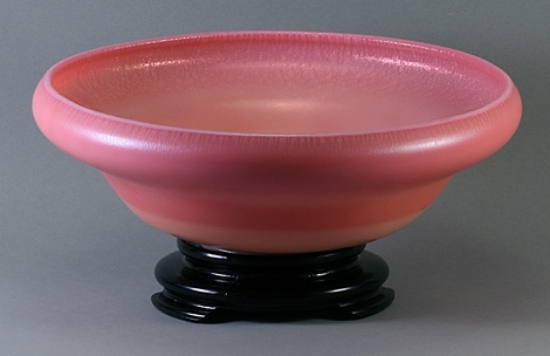 As far as I know, Fenton didn’t iridize any opaque or translucent glass during their classic period of stretch glass production. 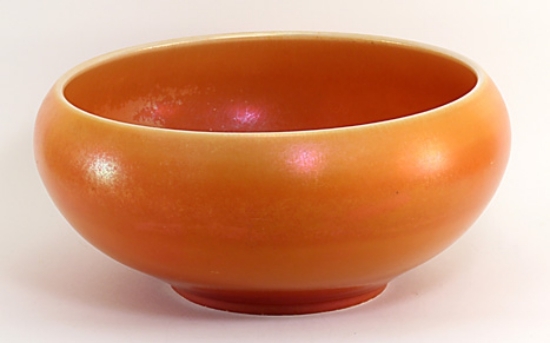 With that said, I know of one Flame (orange slag glass) bowl that has shown up with stretch iridescence. This was likely a trial piece and it’s a shame that it didn’t make it into the regular production! 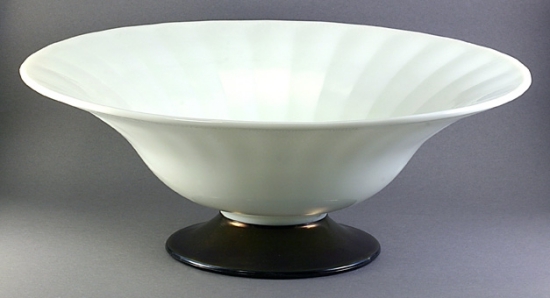 In their modern production period (early 1970s until they closed), Fenton was asked to make a black stretch, twin-dolphin comport by the Stretch Glass Society (1996). A good turn allowed for quite a few of these pieces to be made and they can still be found on the market. Iridescent colors “pop” on black glass with the result being electric, multicolored iridescence. 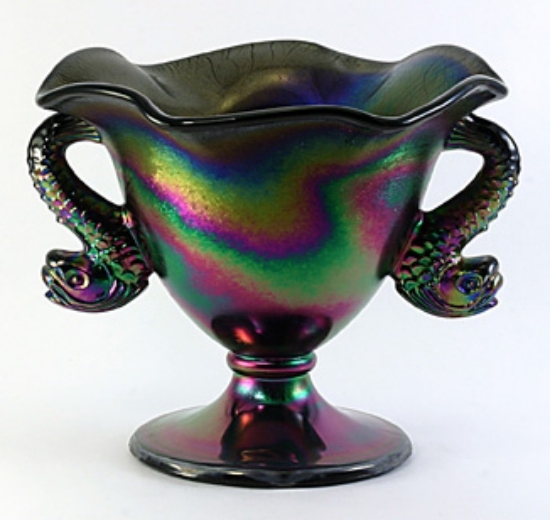 Fenton also stretch iridized some opaque blue as part of their lines and some experimental Rosaline that was only sold in their factory store. Northwood actually included an opaque blue as part of their Rainbow Line – Jade Blue. This blue is generally a robin’s egg blue, but different batches can vary quite a bit. There are dozens of different pieces made in this color and it is one of those “Love it!” or “Hate it!” colors. Carnival and stretch collectors that pass on this color often state that the iridescence just doesn’t “pop.” Jade Blue usually has a very subtle stretch iridescence. 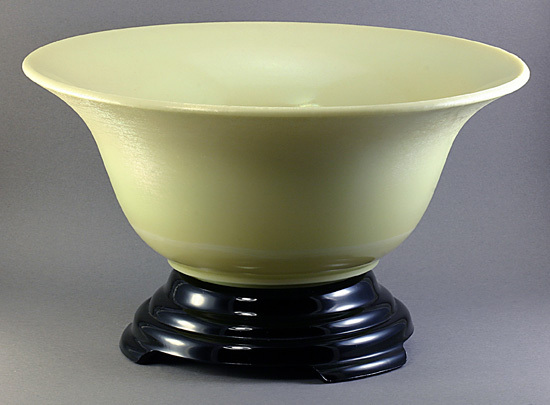 Trade journals of the Northwood period indicate that Northwood also made an “Ivory,” but we’re not really sure if this is the relatively obtainable custard glass (a yellow opaque) or the very rare milk glass (an opaque white). Since the custard pieces are more common, but pretty limited in forms, Ivory is likely this color. The rare milk glass forms are also quite rare and the iridescence is pretty subtle. 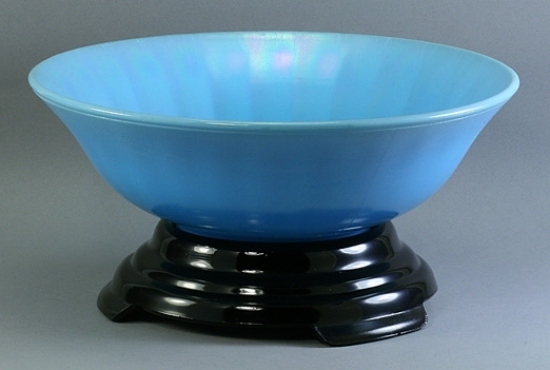 Imperial also iridized milk glass using their Blue Ice (smoke) and Rose Ice (marigold) dopes. Unfortunately (in the mind of a stretch glass collector! ), many of these pieces have shiny surfaces, but a few were reheated and given the stretch effect. These pieces are considered uncommon to rare. Use care when washing these pieces as the iridescence can be scratched off! 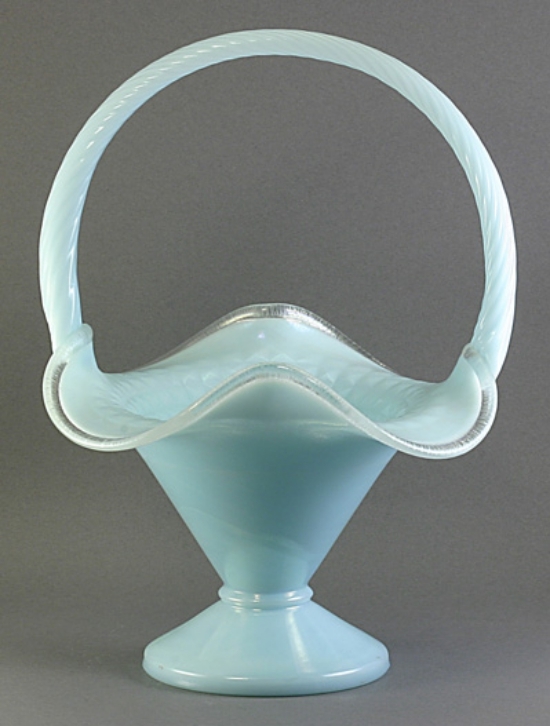 Diamond Glassware included Egyptian Lustre in its stretch glass line. 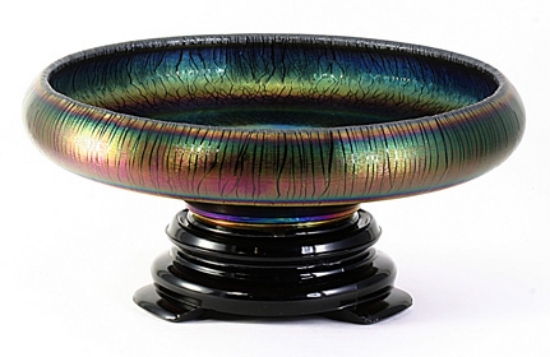 This is a true ebony glass with multicolored iridescence. 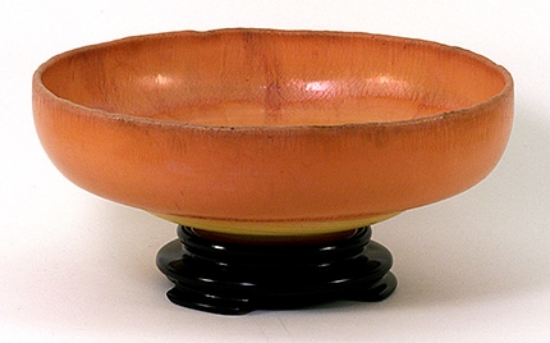 Quite a few bowls and candleholders were made but plates and vases are difficult to find.